The call him The Rookie, but I tell you, that there is a sea mammal with a bright future, as long as he doesn't get another blowhole put in him. Click here to play! He's a new dolphin with the Pacific Ocean Police Department, and from what I've heard, he's shown a lot of promise. He works under that manatee Chief from down south, and he's been partnered up with some old turtle that's been on the beat forever, but still that new dolphin has been getting results. I hear his secret is that he keeps in good with Merl, the octopus clam-phone operator, who lets him know what's going on in the big blue. The Rookie's also apparently got some connections in the shrimp population and he can even work the clams, from what I hear! All these young guns want to clean up the beaches as soon as they hit the water, but this rookie dolphin could just be the one to do it. Join the Pacific Ocean Police Department in their fight against ocean crime! 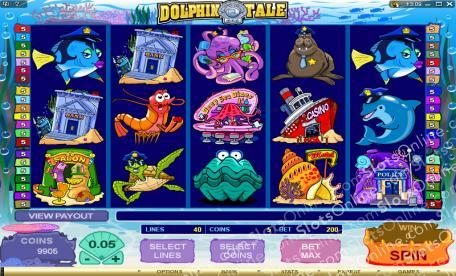 Enlist with the Dolphin Tale slots today, and you could end up with an excellent remuneration package by winning a jackpot. The Spy Clam symbols are scatter symbols that pay out on the total bet and trigger a free spins feature. In this feature, players can choose from a number of free spin options that offer a random multiplier. The more spins chosen, the lower the potential multiplier on prizes during those spins. An Extra Wild symbol also appears during the free spins, substituting for any symbol other than scatter symbols. The Rookie Dolphin symbol is wild and substitutes for all symbols other than scatter symbols.